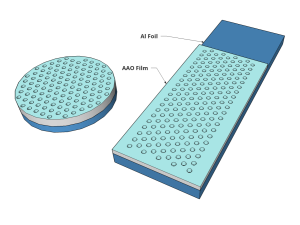 Thin films of nanoporous Anodic Aluminum Oxide (AAO) are often used as nanotemplates or nanostructured substrates without separating them from the aluminum surface. 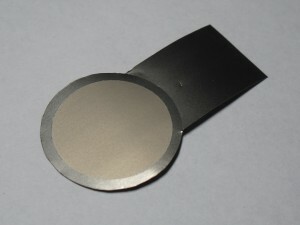 Thin films of nanotubular Anodic Titanium Oxide (NTO or ATO) on Ti foil are one of the most popular form factors in studies focused on applications of this unique nanostructured semiconductor. 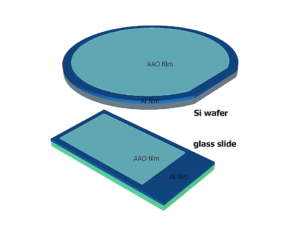 Other applications may require AAO and ATO films that are intimately integrated onto different substrates, such as Si wafers, glass slides or an optical component. Click on the images below to review and purchase these products. Self-organized AAO nanotemplates on Al foil with pore diameter from 2.5 to 300 nm and interface that could be tailored for electrodeposition inside the pores. Self-organized nanotubular Anodic Titanium Oxide films on Ti foil with wide selection of nanotube diameter and thickness. Nanoporous AAO films integrated onto non-Al substrates, such as glass, sapphire, silicon wafers, quartz, polymer films, etc. Why use AAO and ATO products from InRedox? InRedox offers free technical support to all customers. Our team of world-class experts in material science and nanotechnology is always ready to help.